Hello all. New guy here. 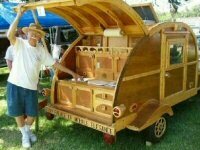 I have made the desicion to tear apart my 25ft Flagstaff camper and build a 20ft long, 6ft tall cabin car/ teardrop. Just finished redoing the trailer and now working on the floor. Any suggestions or links to something this large would be helpful. I'm using alot of stuff from the camper. Man those aluminum frames sure are horrible. I'm going all wood. So I will keep you all updated with pics when I make progress. Here are some pics of the tear down and the trailer as of last week. Will update with better pictures soon. Does anyone have experience using a full size 25ft double axle trailer? Also has anyone on here used a full size fiberglass camper door with their TD? I want to utilize as much stuff from the camper as I can. I'm using all the windows, interior chairs and seats outdoor shower head. I dont want alot of stuff inside as when we camp we are outside 99% of the time. I plan on using all the electrical components. Also I was thinking, since I only want it 20ft long that leaves me 5ft on the aft end to build a small deck that would be covered by the hatch in case it rains. Does this sound crazy to you all ? I'm pretty excited and have every tool ever needed available to me. I took off work for 2 weeks in may strictly to work on the camper so I hope to get alot completed. Please any guidance or criticism is welcomed. Unless you are planning to haul a quad or something on the deck (which you would probably want at the front anyway), I don't like the idea of a camper deck; at least not for my idea of camping. Think about it, you're in the woods, you've got your camp chairs placed around the fire pit where you can easily tend the fire well into the night, sipping an adult beverage. Get up out of your chair, drench the fire, use your head lamp to make your way to the trailer and crawl into bed. With a porch it will be much more restrictive, there will be so much less space to arrange chairs, for safety reasons it will need to be further away from the fire, and I just know that I would be stumbling off the edge, knocking my shins and/or tripping to climb up in the dark. My advice would be, "hey diddle diddle, cut it in the middle" (or a bit further back). With dual axles you may even want to shorten both ends, depending on weight distribution. Last edited by KCStudly on Thu Apr 26, 2018 10:55 am, edited 1 time in total. Thanks for the info. You are right. I think I will skip the deck. I really dont want to cut the trailer so I may just make the rear kitchen area a little bigger. Not much weight will be in the rear. Basically a light weight fridge, cooler space, cutting board and some drawers. I have a propane grill I like to use but I will use it outside. This is going to be pretty basic concept not alot of bells and whistles and I dont want to use propane for anything in the trailer. I will have Lights, windows, bed, 2 chairs that fold down to bed , t.v., A.C./ heater, minimal kitchen. So it will be roughly 24ft long and 6ft tall. Man this is going to be diffrent. I have 30ft of the rubber roof I can cut to size as well. Windows checked for leaks and cleaned up. Need to figure out if I can use the original camper doors. There is 2 and I was thinking of putting both in on opposite sides. Anyone have any thoughts on that or at least have used camper doors in their build? I DONT want it to look crappy but they are nice doors and screens. This would save me alot of money if I could use them. Also not sure on how many windows I want to use. There is only 2 that are exactly the same. .
That's my plan. I will have a couple drawings posted soon. Hopefully with dimensions. I have a long trailer too, looking forward to seeing your design. What do you have built, Kayak Camper ? Nothing as yet, I have a 15ft caravan which I'll use once this summer and then get started breaking it down in the autumn. The plan at the moment is to build a teardrop style pod on top of a metal rack, the idea being to be able to slide canoes and kayaks underneath. The door and windows look to be in good shape so you might as well re-purpose them in your new build. I will certainly follow along with your build and see what you come up with. My build, if I ever get started, will be the same height and width as yours but only half the length. I will be going almost all foam for my build though. I feel there are several advantages over wood. You asked about the extra length. What I really miss in my Teardrop is space for all the things I only use outside. For example, chairs, umbrella, awning, dressing tent, flashlights/headlamps, wet jacket, tents/tarps/poles/stakes/hammer, table cloth, firewood, etc. A big compartment accessible from outside could be real convenient for things you otherwise stick in your car or tongue toolbox (or on the bed in a TD).